The Albuquerque International Balloon Fiesta is renowned as the world's premier balloon festival. A trip to Albuquerque, New Mexico, is a great way to experience the rich culture and heritage of the American Southwest. The high desert area features over 300 days of sunshine each year, making it an ideal spot for outdoor activities. Affordable attractions and accommodations make Albuquerque a great place for a vacation, while the area's impressive active adult communities also make it a great retirement destination. While Albuquerque is a desert area, its location in Northern New Mexico means that there is a significant difference in temperature depending on whether you visit in the winter or summer months. 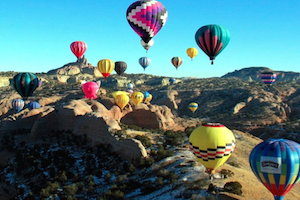 Albuquerque has two peak tourist seasons: the summer months, from June through August, and the early part of October during the Albuquerque International Balloon Fiesta. If you visit during the summer months, expect a dry heat with daytime temperatures in the 90s, along with cooler weather in the evenings. It's a great time for hiking in the mountains, when the cool temperatures are comfortable without bringing the risk of a snowstorm. Summer brings in more visitors and increased travel rates, but the city is still generally affordable. Visiting during the first two weeks of October, during the Albuquerque International Balloon Fiesta, takes more advanced planning. This impressive event is the largest hot air balloon festival in the world and it's an event well worth experiencing. However, hotels book months in advance and rates are typically higher. Outside of the first two weeks in October, the fall is a wonderful time to visit Albuquerque. September is time for the green chile harvest, making it a fabulous time for food lovers to enjoy New Mexico's unique cuisine. Hotels are more affordable in the fall (outside of early October), and also in the spring when wildflowers are blooming and the weather is just starting to warm up. You can save money by visiting during Albuquerque's off-season, from December through March, but make sure you pack warm clothing. Winters in the Albuquerque area are cold, though snow is rare in the lowland areas. If you do like a snowy winter, head up to the mountain to enjoy skiing at Sandia Peak. Otherwise, winter is a quiet time to enjoy Albuquerque's museums, restaurants and other attractions. Hotels typically offer their lowest rates during the winter, though they tend to be busier around the holidays. Once you've visited Albuquerque in different seasons, you may decide it's a place you would like to live. The Albuquerque area features some beautiful active adults communities, such as Jubilee at Los Lunas, Del Webb at Mirehaven and Alegria in Bernalillo. Whether planning a visit or an active retirement, the Albuquerque area offers a beautiful retreat in Northern New Mexico.